George H. Guthrie and J. Scott Duvall, Biblical Greek Exegesis, (Grand Rapids: Zondervan, 1998); 173p, $24.99. and tends to focus on words, phrases, clauses and sentences to the exclusion of the larger discourse. The alternative offered by Guthrie and Duvall is a graded inductive approach to syntax and exegesis. The book is divided into two parts: 1) syntax and diagramming, and 2) the exegetical method. Part one takes the first nine texts from Mounce’s A Graded Reader of Biblical Greek dividing them into manageable weekly segments. Students are expected to provide translations, syntactical analyses of select words, and grammatical diagramming for each passage. Part two expects the professor to either chose a New Testament book or the remaining passages in Mounce’s Graded Reader to which the exegetical method will be applied. and teach students about exegetical tools. The authors intend BGE to work in conjunction with Mounce’s Graded Reader, Wallace’s Beyond the Basics, and the professor’s choice of vocabulary text (they recommend Trenchard). In part one the authors outline their method for doing grammatical and semantic diagramming (semantic diagramming will not be utilized until the student reaches part two as it is more complex). An extensive description of the various semantic relationships that exist is provided along with an example in Greek and English. Each “chapter” or segment of scripture under consideration receives three sections. The first section is syntax. Students are asked to parse, identify case, or describe the function of various words within the passage. The authors provide samples that have been taken from the syntactical discussions in Mounce’s Graded Reader. Section two allots space for students to diagram a portion of the Greek text they translated. Section three is reserved for whatever vocabulary the professor assigns. Students are expected to run about 15 verses, as chosen by the professor, through these 12 steps every two weeks. This should provide plenty of practice for students to become comfortable in utilizing the method throughout the semester. When perusing the stacks for Greek resources, the title of this book immediately caught my eye. As many of you know, I am actively searching for the best way to teach both syntax and exegesis in my local church context. This looked like a good option. One book that teaches with both a graded and inductive approach. Sadly, I don’t think my search has ended. There were many good things about the book, but I feel like the bad outweighs them. Let me start with the good. First, the graded approach is appealing. A student’s ability to translate the Bible immediately provides an extra dose of motivation to make it through the difficult task ahead. Second, students aren’t overburdened with the all the exegetical options at once. They are weaned into the options as they encounter them. Experience is a great teacher. Third, though I disagree with the methodological approach of finding the principles of the text and discarding the rest, I did find their section on application helpful. Students are told to summarize the original meaning, discover the general principles, observe how the principles affected the original audience/context, discover modern parallels, identify various areas of life for application (home, work, school, money), and make specific application. At each point in the process of application, the authors offer examples of how to do it and what it looks like. The bad …. The first part of BGE is almost entirely redundant. The authors expect students to also have a copy of Mounce’s Graded Reader. Mounce’s work provides the passage, analyzes syntax, and teaches the practice of phrasing (similar to grammatical diagramming). It also includes an appendix with phrasing for the first nine passages. BGE has none of this. With the exception of the initial explanation of how to do grammatical diagramming, no other examples are given. No appendix is given to assist students as they learn the practice of diagramming. Furthermore, no explanation is given as to how phrasing differs from grammatical diagramming, something I feel is necessary if both books are used together. Second, why no vocabulary? I understand the desire to allow teachers the freedom to go their own way. Nevertheless, I think it would have been helpful if they included the special vocabulary for the assigned passages. Third, while Appendix A provides a list of all the syntactical categories, there is no explanation of those categories. This most likely is explained by the expectation that students have either Wallace or Mounce handy. I see no reason, however, why one wouldn’t be included. Instead of BGE interfacing well with other resources, it is now dependent upon other resources, multiplying the overall cost to the student and a reduction in desk space. Finally, I found Part Two disappointing. When discussing how to discover the literary context and confines of a particular textual unit, no attention is given to discourse markers that perform that very function. Step 4 includes a brief discussion on the importance of textual criticism, but does not talk about the methods of the discipline. The first step in doing word studies is, “Do further reading about how to do word studies properly” (129). Guiding students to further reading after having discussion the topic is helpful. Claiming to be a book on Greek exegesis and not providing a basic outline of the principles and methods of textual criticism and word studies is unacceptable. 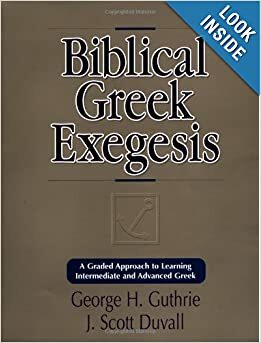 Guthrie and Duvall have created n good resource for their own teaching purposes, as it functions more as a lesson planner than a guide to Greek exegesis. I hesitate, though, to recommend the book to you. 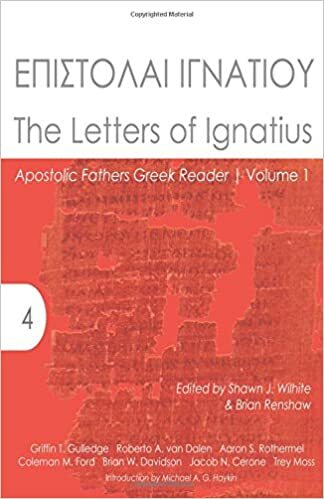 That is to say, if you are a student looking to learn Greek syntax and exegesis without a teacher present, this is not the book for you. Professors, if you are looking for a self-sufficient book to ease your students into the subject, this is not for you. If, however, you are looking for a tool that will help you select and structure material and assignments efficiently and effectively while drawing from other resources for necessary information, then BGE will serve you well. This entry was posted in Book Reviews, Exegesis, Greek, Teaching and tagged Duvall, Exegesis, Graded Approach, Greek Pedagogy, Guthrie, Syntax. Bookmark the permalink.